All clothing comes supplied with club badge embroidered on the breast. Prices are all inclusive. 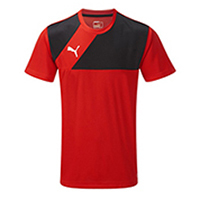 Classically styled moisture-wicking jersey ideally suited to training travel or match-days, bold colour blocked chest panel with printed PUMA Cat branding, traditional crew neck collar for simplicity and easy to wear convenience, open sleeve cuffs and hem, small hole mesh panel on back to improve ventilation and help regulate body temperature, 100% polyester, double knit pique fabric, bio-based moisture wicking finish. 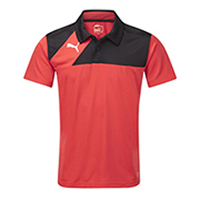 Classically styled polo shirt suitable as a leisure style for travel or match-days, bold colour blocked chest panel with printed PUMA Cat branding, body fabric polo collar with 2-button placket, open sleeve cuffs and hem for an easy to wear relaxed style, 100% polyester, double knit pique fabric, bio-based moisture wicking finish. 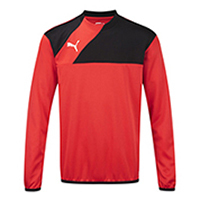 Classically styled cover-up top, ideally suited to training travel or match-days, bold colour blocked chest panel with printed PUMA Cat branding, traditional crew neck collar for simplicity and easy to wear convenience, elasticated cuff and hem binding improves fit and player comfort, 100% polyester microfibre, double knit fabric, bio-based moisture wicking finish. 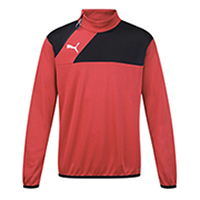 Classically styled woven cover-up jacket, Suitable for leisure, training, travel or match-days, Printed PUMA Cat branding on inserted chest panel, Fully zipped front with performance zip puller for ease of use in all conditions, Elasticated sleeve cuffs and hem, 100% polyester poplin microfibre fabric. 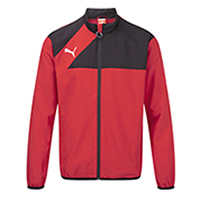 Classically styled woven cover-up jacket, suitable for leisure, training, travel or match-days, printed PUMA Cat branding on inserted chest panel, fully zipped front with performance zip puller for ease of use in all conditions, elasticated sleeve cuffs and hem, additional zipped side pockets to keep contents secure, 100% polyester poplin microfibre fabric. 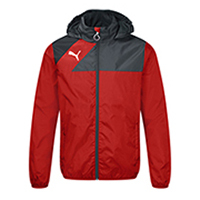 Classically styled wet weather jacket suitable for training and match-days, bold colour blocked chest panel with printed PUMA Cat branding, fully zipped front with performance zip puller for ease of use in all conditions, elasticated sleeve cuffs with open hem, additional open side pockets, 100% nylon ripstop fabric, mesh lining, water repellent coating.